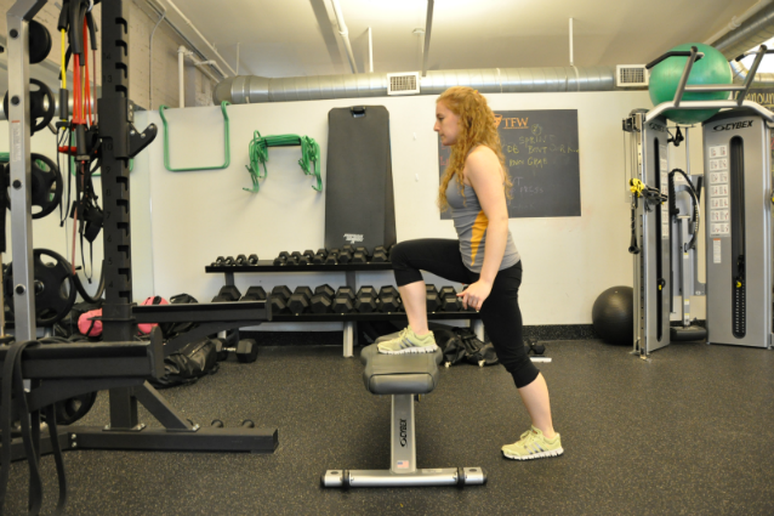 The final lower body move in this workout is the step-up. To perform this, hold a set of dumbbells down by your sides and stand in front of a bench or sturdy chair. Step one foot up onto the chair/bench and then slowly bring the other foot up to meet it. Once standing on that chair/bench, lower back down, leading with the same foot. For the next rep, switch sides and repeat. Continue alternating until all reps have been completed. Ready for a total-body workout? 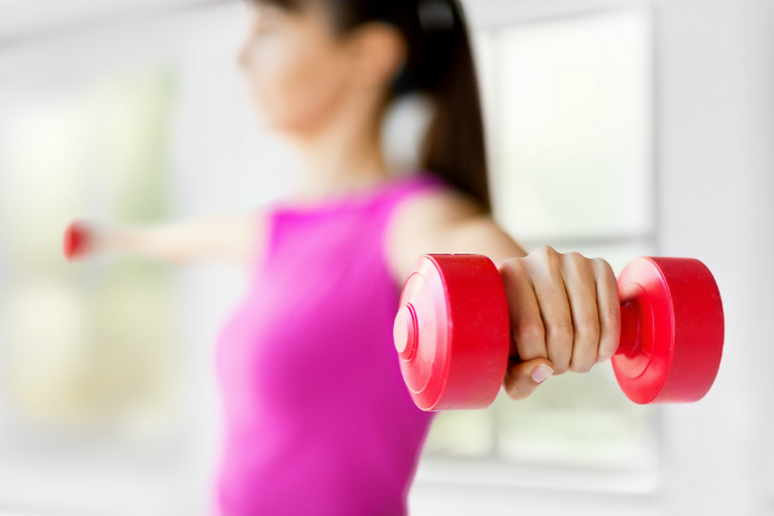 Here are nine strength training moves you can use in one workout to get started. The following exercises can be performed right in your own home with a simple set of dumbbells, making this workout convenient for anyone. To structure this workout, you will be pairing together a lower body move with an upper body exercise, and then adding a core exercise to finish each ‘tri-set’ off. 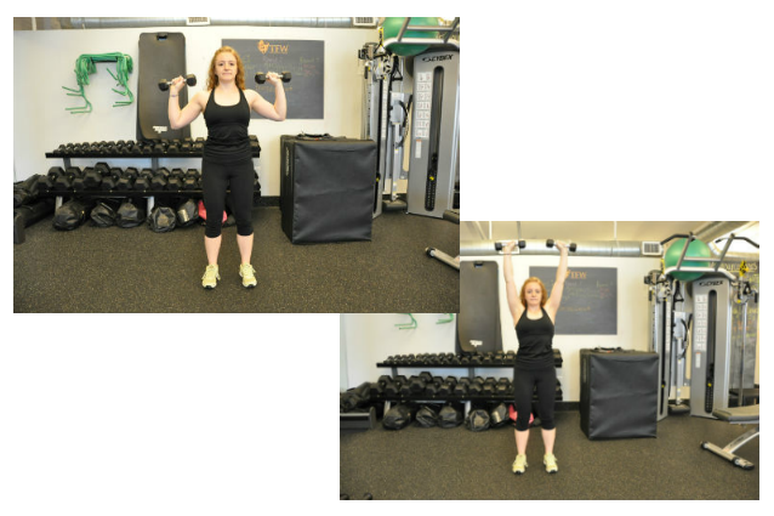 These three exercises should be performed back to back, taking no rest time between each one and after all three are finished, then you can rest for one minute before carrying on. Aim to perform 10 to 15 repetitions per exercise. Once the entire circuit is completed, repeat one more time through. Aim to perform this workout three days per week, taking one day off for rest and recovery between sessions. 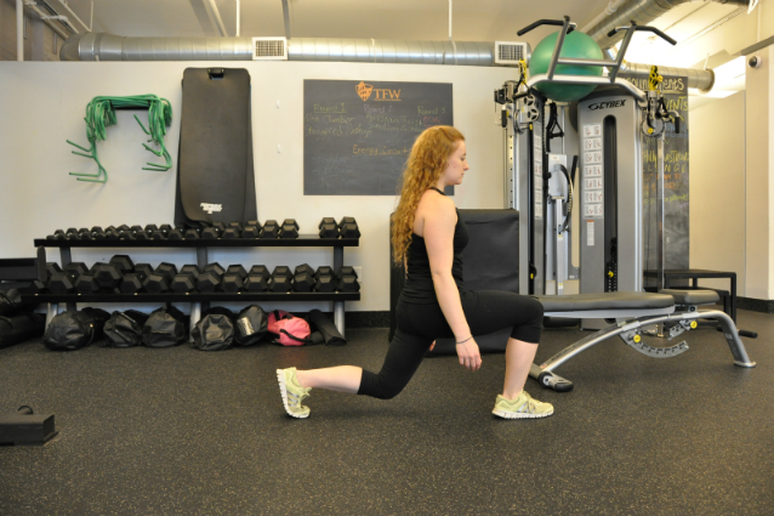 Nothing beats the squat when it comes to a fantastic lower body exercise. To perform this, hold a dumbbell down between your legs, taking a slightly wider than hip with stance. From there, bend the knees as you lower yourself as low down as you can go. Pause for a brief second and then rise up again to complete the rep.
For an upper body move, the push-up is a good classic standby. Get down so that you’re balancing on your hands and either the knees or the toes. From there, lower the body down, keeping the back straight at all times, until your sternum is almost touching the ground. Pause and then straighten up the elbows, pressing up to complete the rep.
To hit the lower abs well, the lying leg raise is a great move of choice. Lay flat down on the ground, back down and bring the legs up so that they are at a 90 degree angle with the body. From here, lower down until they’re almost touching the ground and then reverse directions, bringing them back up again. Continue on until all reps are completed, making sure to keep the back pressed flat into the ground at all times. Holding a set of dumbbells, one in either hand, in an upright position, take one step forward and begin to bend the knee as you lower yourself down into the lunge. Keep the back straight at all times to prevent excess stress from being placed on the lower back. Once lowered as far as you can go, press back up again to complete the rep, bringing the back leg forward and using it to step forward into the next rep. continue alternating legs as you move through this exercise. To perform the bent over row, place the set of dumbbells directly in front of you on the floor. From there, bend over at the waist and then reach forward to grab the dumbbells. Keeping the back flat, slowly contract from the shoulder blades as you bring the weights upward so they move toward the underarm. When you’re as high as you can comfortably go, pause and then lower down to complete the rep. The weights should not touch the floor until all reps are completed. The bicycle is a fantastic ab movement for working the oblique muscles, helping you firm up your love hands. Lay flat down on the floor, legs straight and arms bent, hands by your head. From there, crunch upward and as you do, twist to one side of the body. At the same time, bring the opposite leg upward, bending the knee and trying to get it to touch the elbow. Once as high as you can go, pause and then reverse directions, returning to the start. From here, twist to the other side this time, alternating as you go. Continue on alternating until all reps are completed. The shoulder press is the next great upper body move to round out this workout program. Hold a set of dumbbells, one in each hand and then in the upright standing position, bring them up so they are resting on the shoulders. From there, drive the weights straight above the head until the elbows are extended but not locked. Pause and then bend down again until they are back to shoulder height. Press up to complete the next rep. 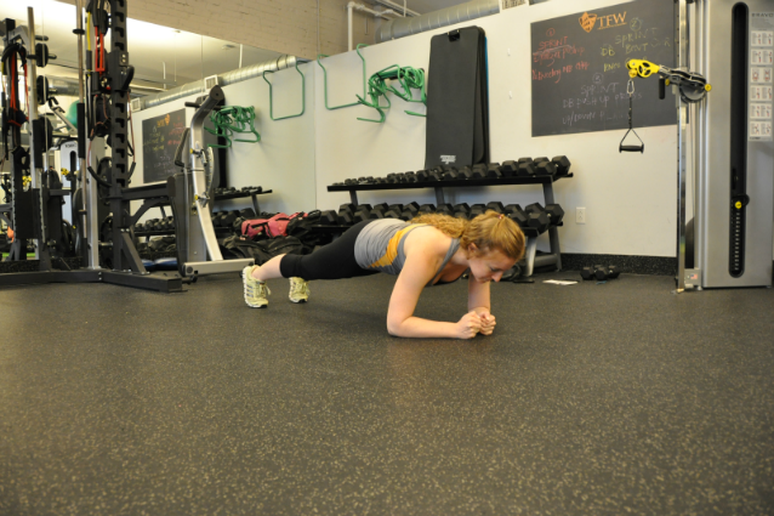 Finally, the last core exercise to finish off this workout is the plank hold. To perform this one, simply get down on the ground so your stomach is down and you are balancing the body on the forearms and toes. Your body should look like a flat tabletop in this position. Now hold that for as long as you can maintain good form. If you ever start to feel yourself coming out of good form, stop and only continue on once you can resume proper form. Aim to hold this for 30-60 seconds before moving on.